i have tissues stuffed up my nose, tears in my eyes because the sneezes won't come out, but also loads and loads of fond memories that will stay with me forever. the artwork was amazing, the music was tres excelente, the company was exceptional, and beyonce was...well, bey. if you get a chance to go, go. it's definitely not for everyone- it's loud, expensive, hot, dusty, etc etc. but the memories you share and the vibes there always hit you in the sweetest spots. i'll remember dancing away to odesza and illenium. i'll remember singing along to vance joy and kygo and swaying to the music with my favorite human bean. i'll remember venturing into russ's set because my coworker told me to, and walking out after two songs because i knew it wasn't my jam. i'll remember fangirling when destiny's child came out and when alina baraz brought out khalid. i'll remember spending $8 on an order of fries, refilling water packs in the bathroom with l, #laquintalabroken, and our group almost starting a grease fire at our airbnb. i'll remember learning about the insignificance of mom's spaghetti, admiring the artwork, and being amazed at the incredible amount of talent that is beyonce. i'll remember the undesirable 100-degree weather + dust, waking up at 4am to catch a flight, and now, the cold that i'm trying to fight. but, coachella 2018 - you were great. can't quite say "see you next year" yet, but thanks for being awesome. these cheesecake bars have nothing to do with coachella, because if i had to make something that reminded me of coachella, it'd be dino nuggets and shin ramen bowls. 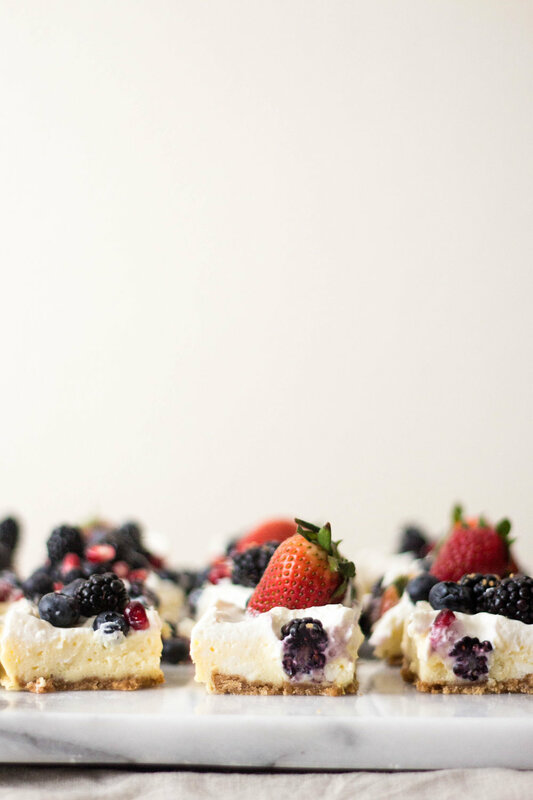 alas, these cheesecake bars are just your basic cheesecake bars topped with berries. nothing fancy here- just a simple graham cracker crust, creamy cheesecake filling, tart sour cream topping, and fresh berries as your topper. jazz them as you'd like or keep them simple- read the baker's notes in the next text block for variations. baker's notes: have fun with this one! add in some lemon zest, swirl some berry jam on top, cover it with whipped cream (after the squares are baked and cooled, of course), use different types of berries, marble in some dulce de leche on top, use oreo cookies instead of graham crackers, etc. make sure everything is a room temp before you mix. a trick that i've learned over the years is to beat the cream cheese until smooth before adding anything. make sure all the ingredients are at room temperature to avoid lumps in your cheesecake batter. preheat oven to 325 f. line the bottom and sides of a 9x13-inch rectangular baking pan with parchment paper (see photos on what i did or read this). leave an overhang on all sides so you can easily pull out the cheesecake from the pan later. make the crust: stir together the crumbs, sugar, melted butter, and salt in a small bowl. press the mixture firmly into the bottom of lined pan. the bottom of a measuring cup or your hands!! will help with this process. bake for 10 minutes and remove from oven when done. leave the oven on! make the cheesecake: while the crust is baking, beat the cream cheese until creamy. add the sugar; beat until fluffy. beat in the eggs, one at a time, until thoroughly mixed, scraping down your bowl after each addition. stir in the vanilla. pour the cheesecake mixture over baked crust (it's ok if it's still hot); bake for 25 minutes. the cheesecake should look puffed, but will jiggle like jell-o. remove the cheesecake from the oven, and cool for five minutes. leave the oven on! make the topping: while the cheesecake is cooling, whisk together the sour cream, sugar, and vanilla. spread the sour cream topping gently over the hot cheesecake. bake the cheesecake with topping for another 10 minutes. remove from oven when done, cool on a wire rack. refrigerate the cheesecake for at least two hours. These cheesecake squares need to be completely set before you top them, otherwise the weight of the berries will sink into the cake. trust me on this one- i learned it the hard way. when you're ready to serve the cheesecake squares, use the overhang to carefully lift the squares out of the pan. transfer them to a cutting board or your serving board, with or without the parchment paper (your choice). 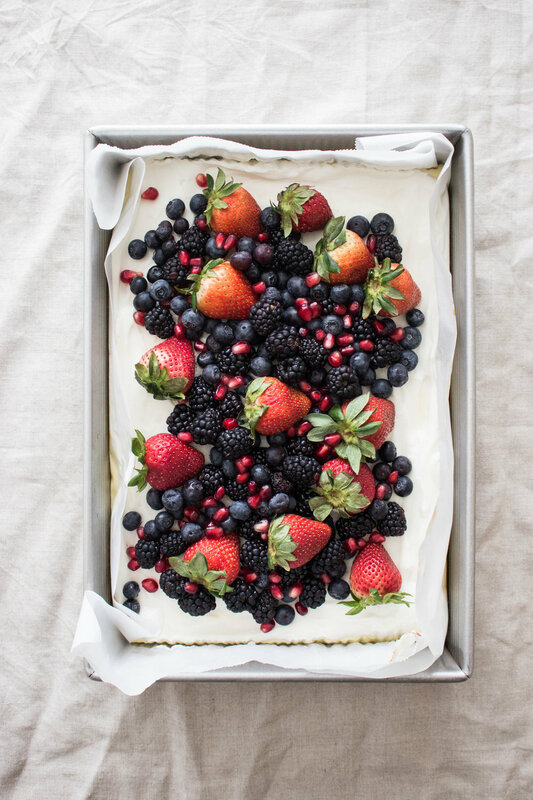 scatter the berries over the cheesecake. using a sharp or serrated knife, cut the cheesecake into squares. store leftovers in the fridge, and enjoy the next day!